I’ve met some pretty interesting people so far. Let me tell you about the Tembo’s. It’s just an inactive mom with her two daughters and I love them to death. They said every new missionary has to either do their hidden talent or do sit ups… So I sang!!! hahaha. They loved it so much they invited us for dinner. The people here are amazing, they have the most precious little kids. Yesterday this kid just walked up behind me and held my hand. His name is Elijah, we’ll be teaching his family next week. I’m supposed to be baptizing a kid named Samuel this Saturday and I got a brand new investigator accept to be baptized. I couldn’t believe it! The people here have strong faith in a living God and I’m really able to connect with them. I’m pretty sure that I’m the only white guy in like 10 miles so I get a lot of strange looks from people and all the kids say “Muzungu!! !”… white guy hahaha. Drivers here are nuts, and when we want to get anywhere far we have to take something called a “taxi”. A taxi is basically a cramped van where the drivers will shout where they’re going and you’ll pay them like 3 Kwacha for a ride, it’s like a quarter. It’s a serious blessing to have two local companions to start off with because people here just look at me and think money. I never pay for anything, I just hand my money to my companion and he pays for me. They don’t put prices on anything so they’ll charge white guys whatever they want. I got to watch conference for the second time at church this week end. The talks really rang true to me while listening to them for a second time. That day we taught someone about prophets and she accepted to be baptized. Today we had a zone activity to a reptile zoo! We took our trucks in to the wilderness to find this place and we saw all sorts of cool stuff! I held a python, a tortoise, a brown snake, a chameleon, saw crocodiles, I even ate a croc burger! I’ll send some pictures. The work is going great, I’m serving in the capital, Lusaka. My new companions are Elder Tayembi and Elder Musika from the Congo and Uganda. 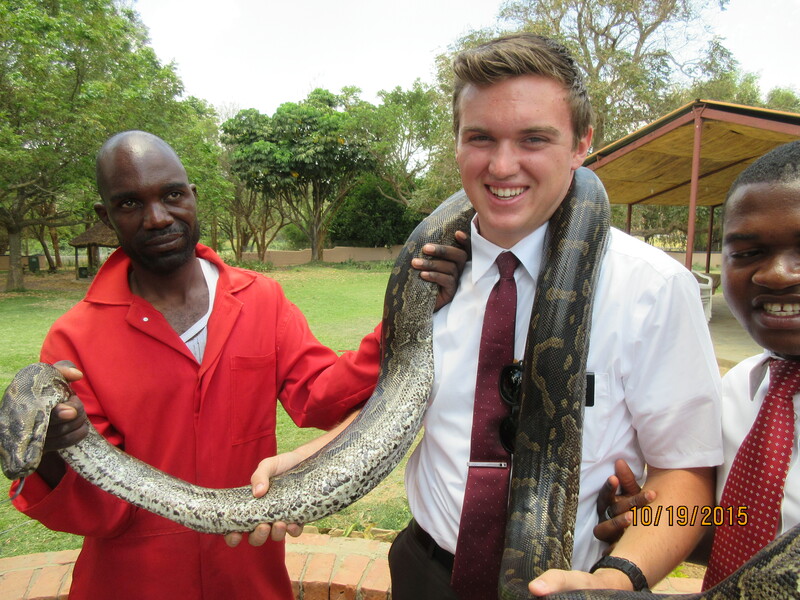 Elder Tayembi can speak french and Elder Musika can speak Lugandan, but they both speak fluent English. Isn’t it cool that my mission president is from Alpine!? He’ll be living in Suncrest when they get back in like 5 months, you should totally visit them. The work is really going great and I love the missionary life!!! I love spreading the gospel and more importantly sharing my testimony, because it only makes mine stronger. I’ve now marked about half of the Book of Mormon. To be honest it’s a hard life here but I’m just going to keep on keepin’ on. I know that my Heavenly Father loves me and he’s looking out for me because of my decision to serve. I know that this church is true and Joseph Smith was a true prophet of God, I know it. I love, and appreciation for your guy’s letters. I really miss you guys.